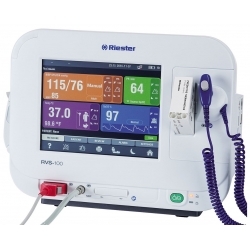 Riester RVS-100 Advanced Vital Signs Monitor is a high performance device intended to deliver outstanding flexibility. Modular design with easily adjustable features successfully addresses the individual monitoring requirements of hospitals, clinics and variety of office based and long-term care settings. Configured with Monitor, Spot-Check, Triage monitoring profiles and a Neonatal mode, the Monitor can be used on a wide range of patient age groups. Designed to maximize workflow efficiency and simplify the unit operation to the maximum without any compromise in functionality, this Monitor incorporates a large, 8" TFT color touch screen. In addition to excellent visibility, the screen is configured as a high-sensitivity unit that allows for operation precision. The superb touch screen performance is assured with the help of self-explanatory user interface and integrated help-function. These advanced features promote user confidence, allowing to master the Monitor controls in no time. The screen displays SYS, DIA, MAP, Pulse, Temp readings and Plethysmogram. 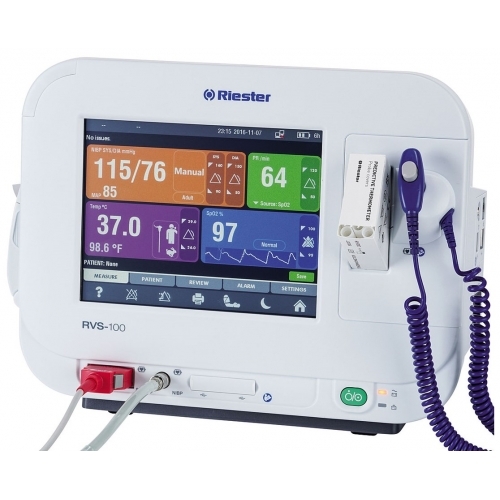 The RVS-100 Monitor features excellent connectivity options for the hospital’s EMR according to the HL7 standard and numerous accessories. 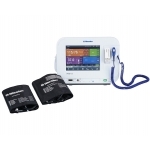 It allows communicating through a wired or wireless connection and includes 4 USB ports, 1 standard RJ45 interface, 1 Equipotential grounding point, 1 RJ11 connector for nurse call and a DC out port 15V/1.2 A. Programmable alarms feature 3 priority levels and are accompanied by LED multicolor visual and audio indicators. A generous internal memory capacity is sufficient for storing up to 5,000 measurements. The Monitor is powered off a rechargeable Lithium-ion battery that facilitates 17 hours on-time and 11 hours of run time in Automatic mode with 15-minute intervals. The modest unit dimensions of 11.93"L x 9.05"H x 4.33" promote a space-saving concept allowing to fit the Monitor even into tight hospital settings. All RVS-100 Monitor models include a medical-grade non-invasive blood pressure measurement function. The system uses an automatic oscillometric measuring method and provides systolic, diastolic and MAP readings on adult, pediatric and neonate patients. The measurement is exerted in 40 to 240 bpm range with ±5 mmHg clinic accuracy. The monitor comes with two BP cuffs of adult and large adult size with 160 mmHg initial inflation pressure. Adjustable system alarms include separate track function for systolic, diastolic and MAP parameters in a range from 0 to 300 mmHg. The RVS-100 Monitor comes with Riester SpO2: SpO2 system by Riester features extended average time options that include 4, 8 and 16 second interval setting capability. It includes a pulse rate measurement function with 20 to 250 bpm range. There are Monitor model options that include a predictive temperature function. These models are assembled with Filac 3000 Predictive Thermometer and include oral temperature probe and a set of probe covers. The Thermometer facilitates temperature measurement in Oral Quick or Standard modes, as well as Axillary, Rectal and Direct modes allowing excellent diagnostic versatility. The Quick Predictive mode is helpful when time is at shortage; it facilitates an even faster temperature determination with an excellent accuracy of ± 0.3ºC (±0.5ºF). An integrated thermal printer facilitates a hard copy of the vital signs reading on a strip. It does not take up any additional space and is comfortable located on the side of the monitor not causing any distractions or complicating your work with the screen.